Hello. I’ve been asked on many occasions if I create my birth illustrations with the use of images and computer graphics. I always state that my illustrations are done-by-hand (the old fashioned way with paper and pencils!). I thought it might be useful to illustrate (pardon the pun) the process that goes into creating the illustrations that I produce. This is the concept/ideas stage. 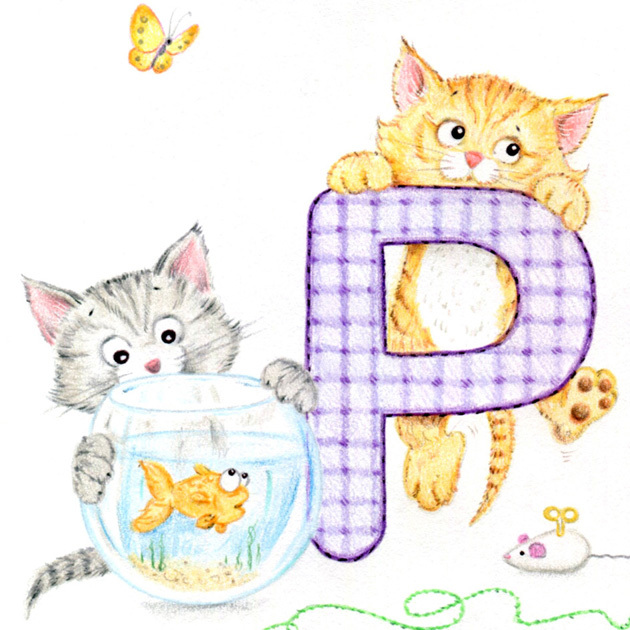 Once I know what theme the parents prefer (such as kittens, jungle animals, spacemen etc), my brain goes into overdrive and I try the different characters (in this case – kittens) in different positions around the letters of the child’s name. Once I have played around with the characters, in my mind’s eye, I scribble a very quick ‘scamp’ down on paper – showing different aspects of what I hope to include in the final illustration. Following on from the ‘scamp’ stage, the idea is sketched out around the proposed lettering. I nearly always sketch in blue pencil (I must have some royalty in my family tree!) and refine the ideas and the characters as I go. Once Stage 3 is completed, the scamp and sketch can both be discarded. Please note that I try different expressions and ideas out around the edge of the paper. I also give an indication of colours. The final line-drawing is produced for the illustration. If there are any parts that I wasn’t totally happy with at the sketch stage, these can now be re-drawn. 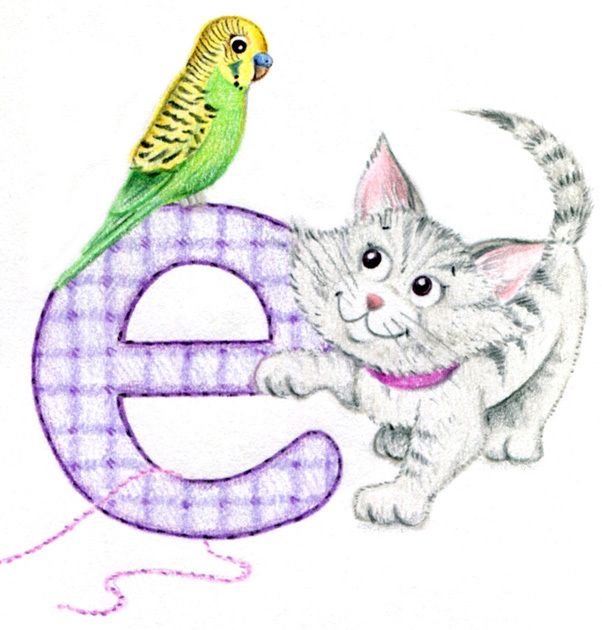 These will nearly always be minor adjustments, such as, the kitten’s expression has changed on the letter ‘b’ and the budgerigar has moved position on the second letter ‘e’. This is the enjoyable part (usually) after the ideas and sketching has been done. I normally indicate (on the scamp and sketch) certain colours that I want to see in the final illustration. The mother of Phoebe, suggested she would like a gingham design to the lettering and that the budgerigar should be of the green-and-yellow variety. I hand-draw the lettering that personalises each illustration. The colours of the lettering can often ‘mirror’ the colour scheme of the child’s nursery/bedroom, or, more often, I just select certain colours from the main body of the illustration, whichever is preferred. I am privileged to have had a birth illustration completed for me by Michael. It has pride of place in my daughter’s bedroom.